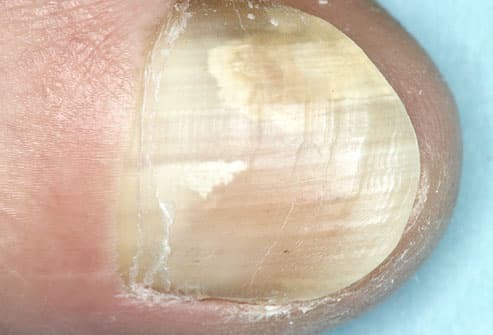 Tiny fungi can get inside your nail through a crack or break, causing an infection that can make nails thick, discolored, and brittle. The fungus, which thrives in warm, wet places, can spread to people who swim a lot or who have sweaty feet. An infection won't go away on its own, and it can be hard to treat. Creams you put on your nail may help mild cases. Antifungal pills or surgery to remove the nail offer the best chance of clearing up a severe infection. Is a bunion, corn, ingrown toenail, or a bad case of athlete's foot causing you pain? Keep your feet happy and healthy -- learn the symptoms of common foot problems and what you can do to treat them. 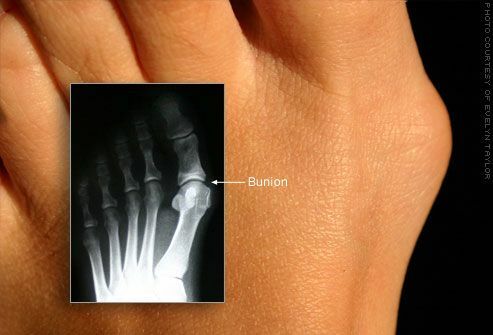 This bony bump at the base of the big toe causes that toe to veer toward the others. It throws foot bones out of alignment and can be painful due to pressure or arthritis. It might also lead to corns. Pain relievers, pads to cushion the bunion, custom shoe inserts, or surgery may help. You could also wear roomy shoes and avoid high heels. Friction or pressure causes these thick, hard, dead areas of skin. Corns look cone-shaped and point into the skin, usually forming on pressure points from poorly fitted shoes or a bone spur. 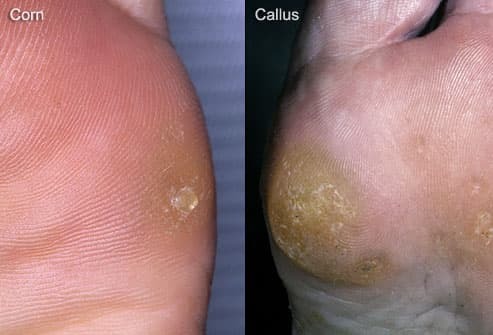 Calluses tend to spread out more and can appear anywhere something rubs on your skin. Moleskin pads can help relieve a corn. Your doctor can trim calluses or correct them with surgery. You can also wear patches with medication that can remove calluses. It's a form of arthritis that causes sudden pain, redness, swelling, and stiffness. 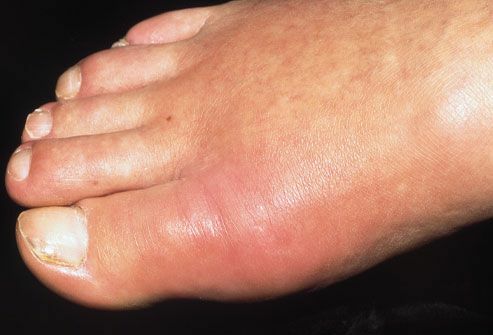 It usually affects the large joint of the big toe, but it also can flare in the foot, ankle, or knees. Gout comes from too much uric acid (UA) in your body, which can form needle-like crystals in joints. Attacks can last days or weeks. You can treat it with drugs that fight inflammation (pain, redness, and swelling) or UA-lowering medication. Some diet changes help break down uric acid, too. These tough growths form on the soles of the feet. You get them when a virus enters your body through broken skin. They can spread through skin-to-skin contact or on surfaces in places like public pools and showers. 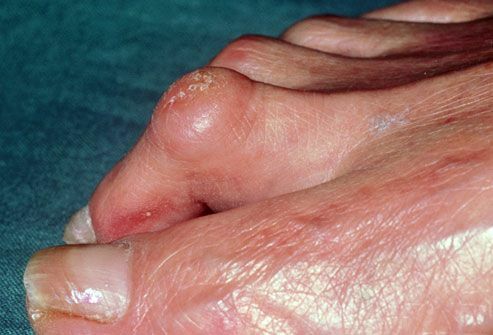 The warts are harmless, so you don't have to treat them. In many cases they're too painful to ignore, though. You can apply salicylic acid to help get rid of them. But burning, freezing, laser therapy, and surgery to remove them work best for more severe cases. This fungal infection can cause peeling, redness, itching, burning, and sometimes blisters and sores. It's mildly contagious, spreading to others by direct contact or by walking barefoot in places like locker rooms or near pools. The fungi then grow in shoes, especially tight ones without air flow. Treatments usually include fungus-fighting lotions, or pills for more severe cases. When toe muscles around the joints get out of balance, they can cause painful problems. Hammertoe generally makes the second, third, or fourth toes bend downward at the middle joint. The condition sometimes runs in families. Other risks include tight footwear or an old injury to a toe. Well-fitted shoes with the right amount of space in the toe box, shoe supports, and surgery may offer relief. 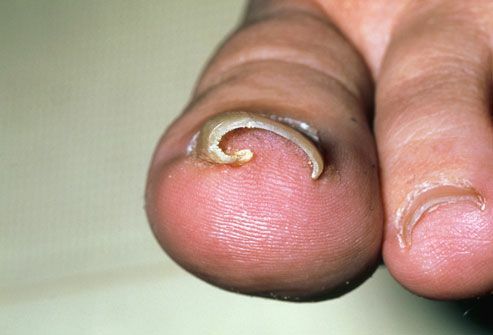 It's just how it sounds -- a toenail that has grown into the skin. The problem can cause pain, redness, swelling, and infection. You can get them from cutting your nails too short or not straight across, injuring a toenail, and wearing tight shoes. 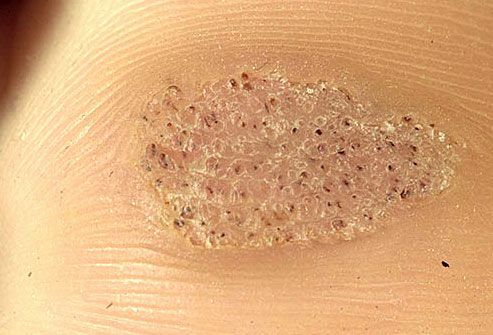 For mild cases, soak your foot in warm water, keep it clean, and wedge a small piece of cotton under the corner of the ingrown nail to lift it off the skin. Minor surgery can remove all or part of the nail. You have this condition when your sole makes complete or near-complete contact with the ground. You can get it after an injury or because of a health problem, such as rheumatoid arthritis. Most people don't have symptoms, although weight gain, ill-fitting shoes, or standing a lot may cause pain in your feet and legs. Foot-strengthening exercises and shoes with good arch support or orthotics can help. (3) Copyright 2007 Interactive Medical Media LLC and Copyright © ISM / Phototake — All rights reserved. (7) Copyright © ISM / Phototake — All rights reserved. (10) © ISM / Phototake — All rights reserved. Jonathan Cluett, M.D, "About.com," Orthopedic Surgery Fellow in Sports Medicine and Arthroscopy, California. National Health Services (NHS) Direct. University of California, Davis, Student Health Services web site.